Click here to download Episode 3 on iTunes. Don't forget to subscribe! Mitchell has been recognized as a major force for good in the fight for gay rights by numerous organizations, including: The Human Rights Campaign: Board of Directors for seven years and Nov. 2007 Equality Honoree, Palm Springs. National Black Justice Coalition: April 2008 Leadership Award. Out magazine: April 2007, "Top 50 Most Powerful Gay People in America" list. Gay Men's Health Crisis: March 2007 25th Anniversary Dinner Honoree. The Advocate magazine: 2006 "People of the Year Award" for Faith in America. Vox Vodka + Out: 2004 Vox/Out Voices of Style + Design Award. 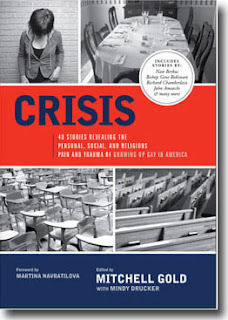 Mitchell's work for gay rights has forged friendships with prominent members of the gay community--and led to a number of them wanting to join him in creating his recently released book entitled "Crisis: 40 Stories Revealing the Personal, Social, and Religious Pain & Trauma of Growing Up Gay in America." As you hear in ‘For Somebody’, Jake's soaring, melodic, heartfelt music, coupled with his distinctively emotive velvet gravel voice is both intensely personal and universal. According to Jake, "I want to be as raw and truthful as I can. When I'm playing a show, I try and engage myself fully with every person, as if it were just our time." "If I haven't made half of the audience cry, not out of sadness, but out of hope, then I haven't done my job, or lived up to my dream. I am trying to inspire them to remember what it is they are seeking. "He pauses and smiles with a look of heartache, " For hope is so easily swept away by the storms of our lives." This week I am asking that you take action on "Don’t Ask Don’t Tell". You may have heard the news lately a lot of coverage of the discriminatory "Don’t Ask, Don’t Tell" policy of the US military. My good friend and fellow podcaster Kathy of "Thoughts from a Lezzymom" had great coverage of this topic on her recent episode. It was her suggestion, and I am asking that each of you take action this week, and call the White House and ask that the President live up to his campaign promise and repeal "Don’t Ask, Don’t Tell". You can reach the White House by calling (202) 456-1111. Nice work. You are doing a great thing. I found the interview very thoughtful and it was gracious of Mitchell to take the time to talk with you. I really loved this episode and I truly applaud everyone who was on this show. From Nathan your great new show to Mitchell book that I will purchasing today to Jake's music which was amazing!